Fleas can make your pet itch and cause considerable discomfort. Because fleas are so tiny, you might not even see them! An unseen flea can begin feeding on your dog or cat within seconds. And within 24 hours of its first blood meal, a flea can begin laying eggs! Egg production can reach a rate of 40–50 per day1, resulting in an infestation. That's why it's critical to kill fleas quickly. But...it gets worse....Fleas on your pet are more than an itchy annoyance. Fleas are also a vector for many conditions, including infestation with tapeworms. The tapeworm that infects cats and dogs, Dipylidium caninum, is a member of a large group of parasitic flatworms called cestodes. A fully mature adult tapeworm consists of the head segment, a neck segment, and multiple tail segments. By the time the tail segments drop off, they are mostly just an egg sac. The sac is passed out through the host’s digestive tract. The segments look like small grains of rice and are able to move. Segments that have dried up look like sesame seeds. When the sac breaks, the eggs inside are released. The good news is that you or your other pets cannot get tapes from the segments being passed by your infected pet. The egg must develop further before it can infect a mammal. 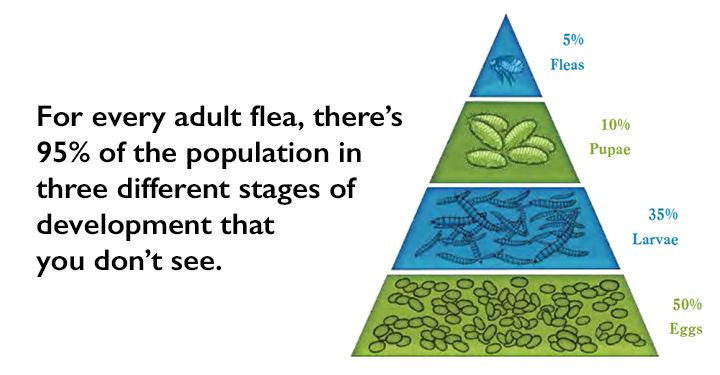 Here is where the flea becomes a factor. 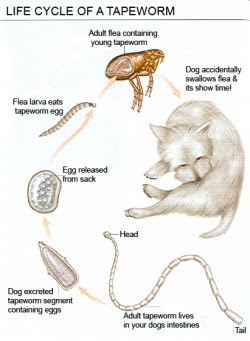 In pets with flea infestations, the larval fleas hatching in the area consume organic debris, flea dirt (digested blood shed by adult fleas–it looks like pepper) and any tapeworm eggs. The tapeworm egg proceeds to develop inside the flea and by the time the flea is an adult, the tapeworm can infect mammals. When a cat or a dog swallows the infected flea, something that is very easy to do during regular grooming, the cat or dog becomes the new host. The flea body is digested, the tapeworm is released and it finds a spot to attach and continues the lifecycle. While the segments that hold the eggs are small, an adult tapeworm can be six inches long or more. Most pets infected with tapeworms show no signs of illness. Tapeworms require very little nutrition to thrive, and healthy dogs and cats don’t suffer from tapeworm infection. Most owners only know their pet has the parasite when segments appear in the stool or in the fur. It is possible, although highly unlikely, for humans to become infected with D. caninum, via the same method as cats and dogs, swallowing an infected flea. Tapeworm infection can be treated with oral, injectable or topical drugs. The adult worms are killed and digested and do not pass out with the stool. Although tapeworm infections are not generally serious, they should still be treated. Owners should also consider tapeworm infections as evidence of current or prior flea infestation and take appropriate steps to remove and prevent fleas. To protect your pet and home from fleas, it helps to understand the flea lifecycle. Adult fleas can begin feeding within seconds of finding a host. They must feed to begin reproduction, and female fleas will begin producing eggs within 24 to 48 hours of taking their first blood meal2. Female fleas can produce 40 to 50 eggs per day, up to 2,000 in their lifetime1. The eggs readily fall off the hair into the environment, so you can think of your dog as a flea-egg “salt shaker.” Wherever the pet spends the most time is usually where the heaviest flea infestations are found. Larvae hatch from eggs in one to six days given appropriate environmental conditions (a relative humidity between 50 percent and 92 percent). Their principal food is adult flea feces (“flea dirt”)3. A mature larva transforms into a pupa inside a silk cocoon. Under most household conditions, the adult flea will emerge in three to five weeks. However, a fully developed flea can remain inside the cocoon for up to 350 days4, a reproductive strategy that enhances the flea’s chance of survival. This helps to explain how a flea infestation can seemingly “explode” out of nowhere, even inside your home. Adults emerging from cocoons can begin feeding immediately if a host is present. They are attracted by body heat, movement and exhaled carbon dioxide2. Adult fleas can survive throughout the winter on pets as well as on wildlife!